It’s been nearly six years since I posted my first geomorph to the blog as part of a series of 100 geomorphic posts (that since increased to who knows how many by the end). In the six years since then, my skills have improved dramatically. 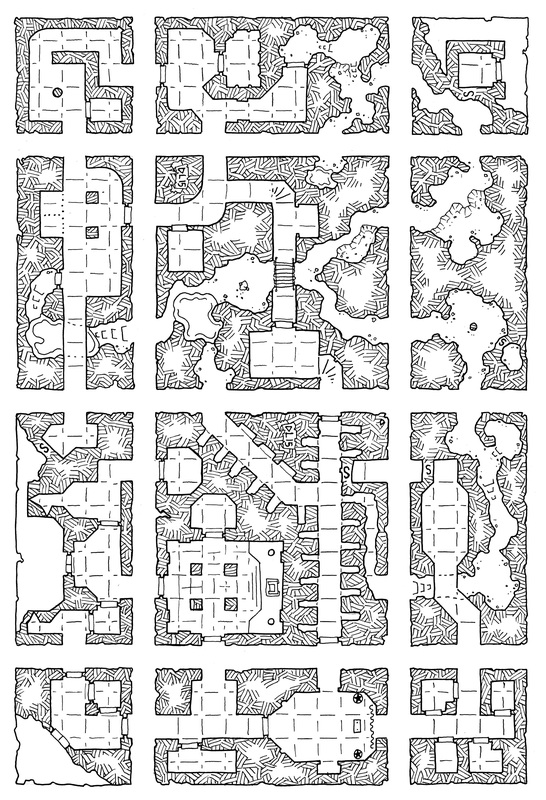 When talking to David Millar of Dave’s Mapper, I took him up on a request to draw a new geomorph or two, and finished off by drawing up a full little dungeon made up of 12 geomorphs (2 standard ones, six half-morphs, and 4 corner quarter-morphs). They have been spread out in the map above, but each segment is supposed to sit flush with the next one (I’ve had some confusion from readers in the past when posting geomorph groups wondering why there were such large corridors between the morph segments – those are not corridors, they are just spaces between the segments that make up the final map). Personally, I like the idea of giving the players a few of the morphs prior to a game as a “treasure map” of sorts (preferably one of the segments with a secret door) so when they enter the dungeon they can try to find said secret. As always, beautiful work. I love the idea of giving the players a treasure map section. That would be a great incentive for players to explore every nook and cranny of the dungeon (in case they aren’t those kinds of players).